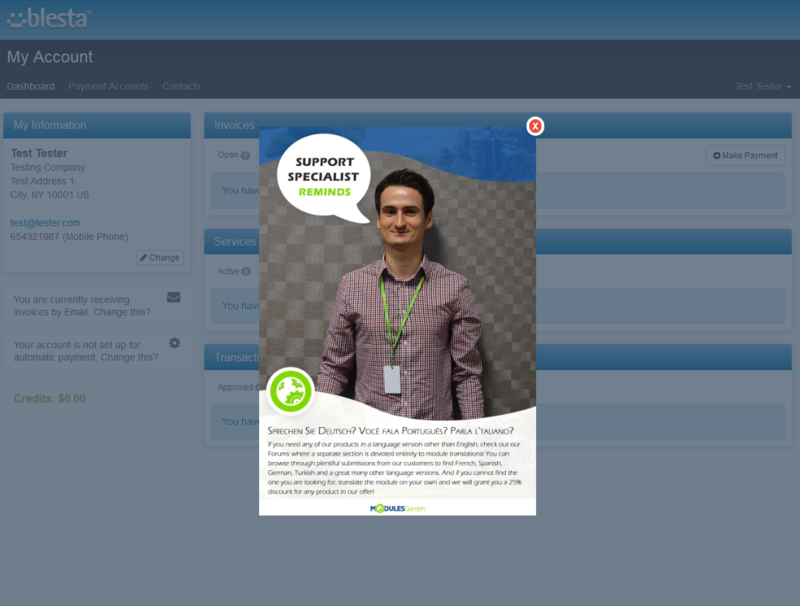 Client Area Popup For Blesta is an extension which allows you to design fully tailored pop-ups that will be seen by your clients in their panel. Choosing from different formats: an image, raw or HTML text, create a pop-up that will reach your clients directly. Compose it using predefined styles, which can always be adapted to suit your needs perfectly. 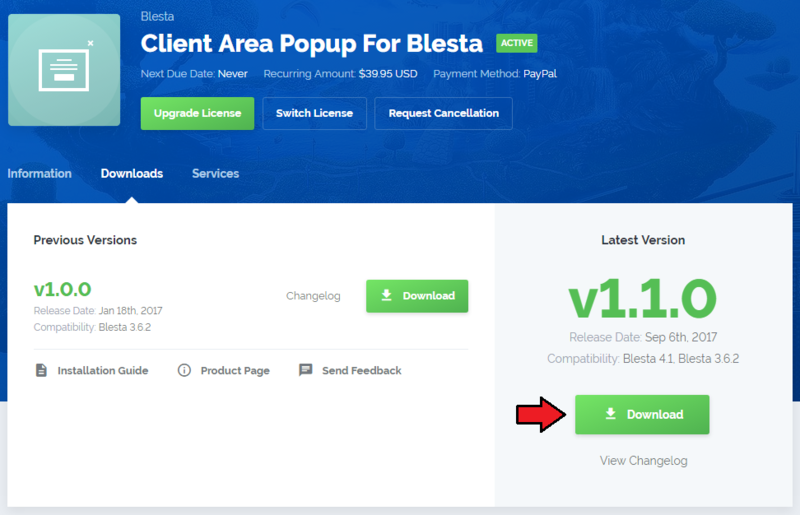 This tutorial will show you how to successfully install and activate Client Area Popup For Blesta. We will guide you step by step through the whole installation process. 4. When you install Client Area Popup For Blesta for the first time you have to rename 'license_RENAME.php' file. 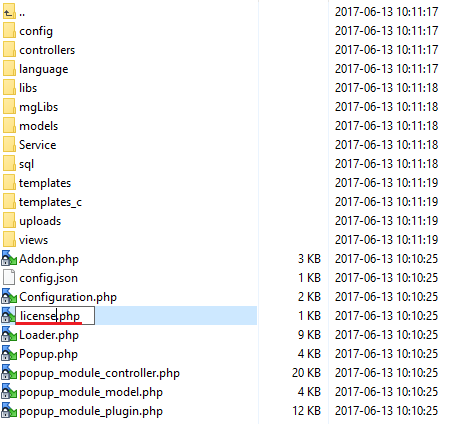 File is located in 'plugins/popup_module/license_RENAME.php'. Rename it from 'license_RENAME.php' to 'license.php'. 6. Set permissions to folders: 'plugins/popup_module/templates_c/' and 'plugins/popup_module/uploads/' to '0777'. Now, you have to install the extension in your Blesta system. 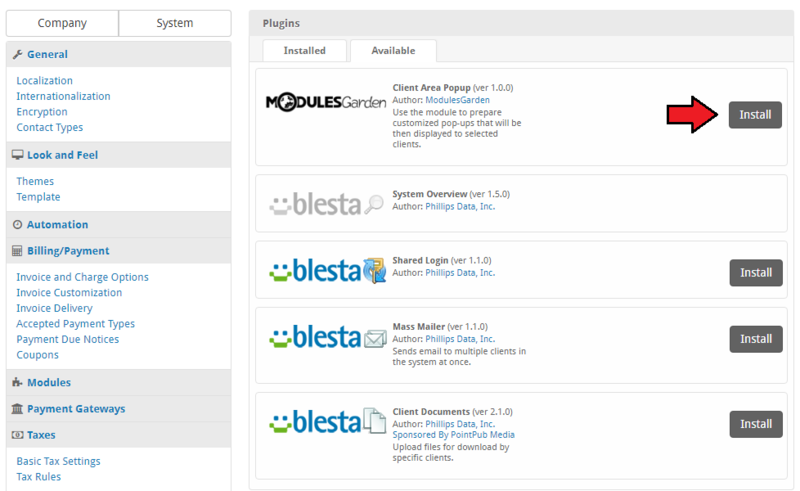 Log in to your Blesta staff panel and proceed to 'Settings' → 'Plugins' → 'Available'. 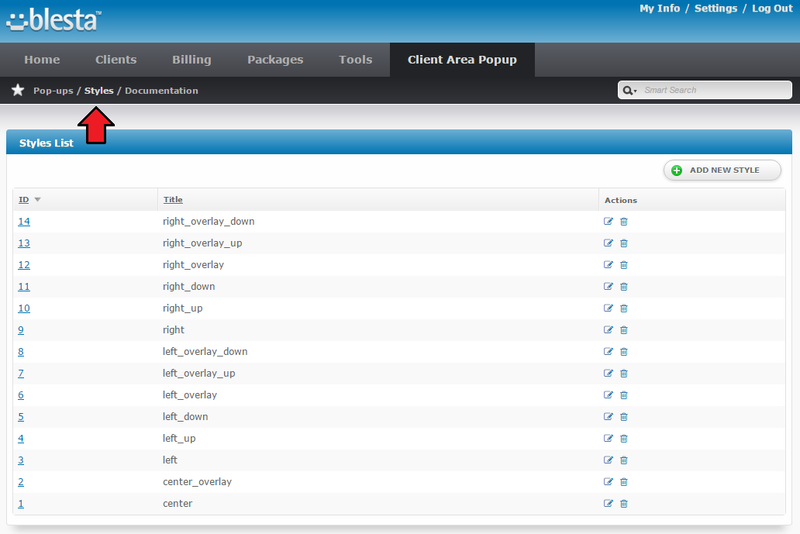 Afterwards, find 'Client Area Popup' and press 'Install' button. You have just successfully installed Client Area Popup For Blesta! A new tab should now appear in your Blesta. Client Area Popup For Blesta is an extension which enables you to inform your clients by showing them ready-made and tailored pop-ups directly in their panel. Below, you will find instructions on how to draft and customize such pop-ups. The plugin does not require advanced configuration. That is why, we will immediately proceed to the most crucial aspect, which is creating a pop-up. To add a new pop-up simply press an appropriate button. Start with naming the pop-up. Note: the title will not be displayed in any way on the final pop-up. If you have already other pop-ups created, you may copy their settings to the newly created one to save a lot of time. Active - for enabled pop-ups. Archived - for pop-ups awaiting activation in store. The next part of creating a pop-up process concerns its interface, layout and general design. Auto - it automatically adjusts to the content. Custom - if you want a customized size, then simply enter appropriate width and height. Select style from the list of available and previously defined styles. More about styles can be found here. The pop-up may have a simple, formated text form or use WYSWIYG editor for more advanced effect. 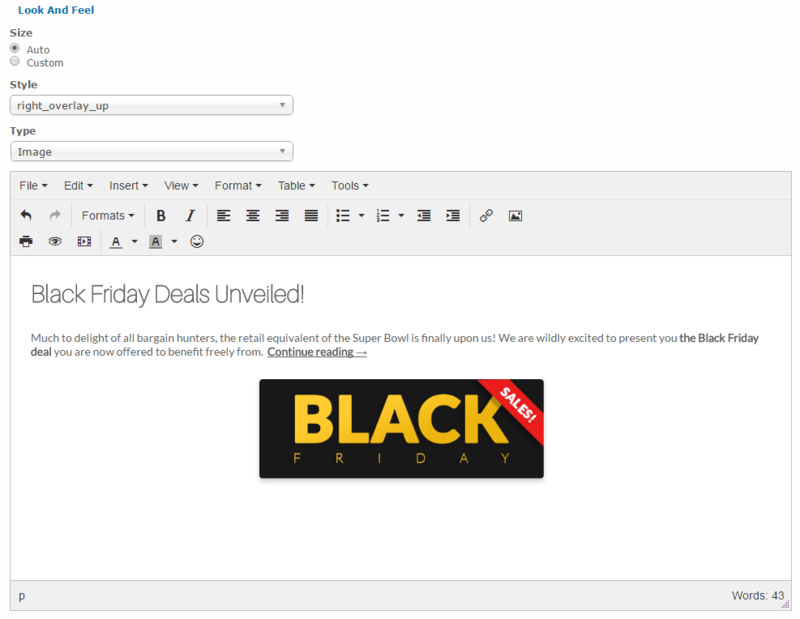 Provide ready code snippet that you want to insert into the pop-up content. Restrictions - this is the place where a pop-up is conditioned. Please set up the rules according to which the pop-up will be displayed to clients. Only clients who meet all the restriction rules will see the pop-up. Display Frequency - define how often the pop-up will be displayed to a client, you may also make it visible all the time. 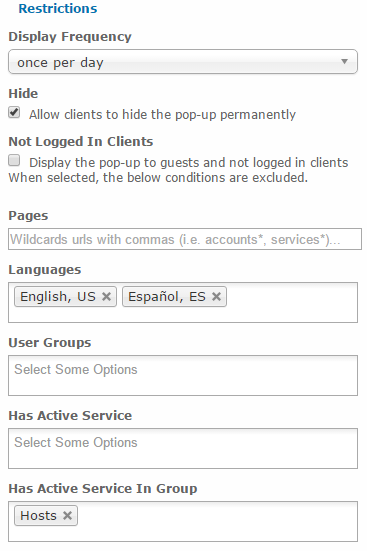 Hide - if selected, clients will be allowed to close the pop-up permanently, even if it was configured to appear repeatedly. Non-logged In Users - if selected, the pop-up will be displayed to all guests and unlogged visitors. 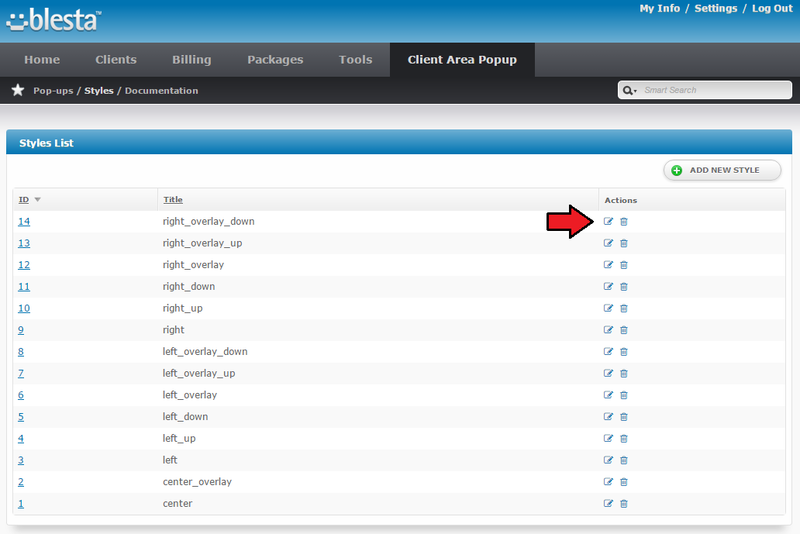 Pages - provide here specific wildcards URL of sites where the pop-up should be available from. Use comma to separate them if you plan to add more than one page. Press required text area and available options will appear. 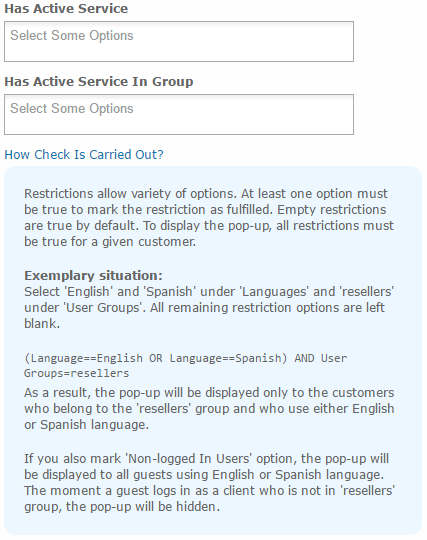 Languages - select languages, the pop-up will be displayed only to clients who use any of the selected here languages. 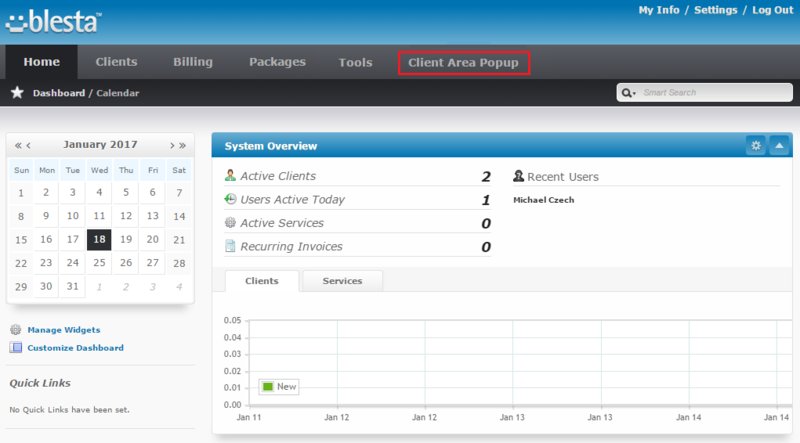 User Groups - point groups, only clients in these groups will see the pop-up. Has Active Product - select products that must be active. Has Active Product In Group - select groups of products that a client has active products in. Note: At least one product in group is required. Has Active TLDs - point TLDs that must be active for the client. Has Active Product With Server - select servers on which client must have an active product. If any of the above options is left blank, it will not be taken into consideration when creating a final list of clients to see the pop-up. In the last section define time period within which the pop-up shall be active - when it will be displayed with the set up previously established. Choose a specific day and hour to schedule the pop-up activation or select option 'Immediately' - then the pop-up will be active once you save the changes. In the same way set up ending date. 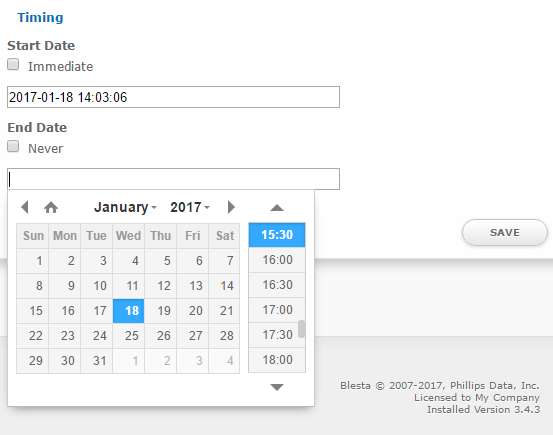 Provide specific date when the pop-up will be marked as 'Inactive'. You may also check 'Never' if you do not want it to be deactivated. Press 'Save' button once you have finished the configuration. The first and main section of the extension is called 'Pop-ups'. You will find there all the most important information on existing pop-ups together with any possible action that can be performed on them. Read through the following section to learn more. 1. 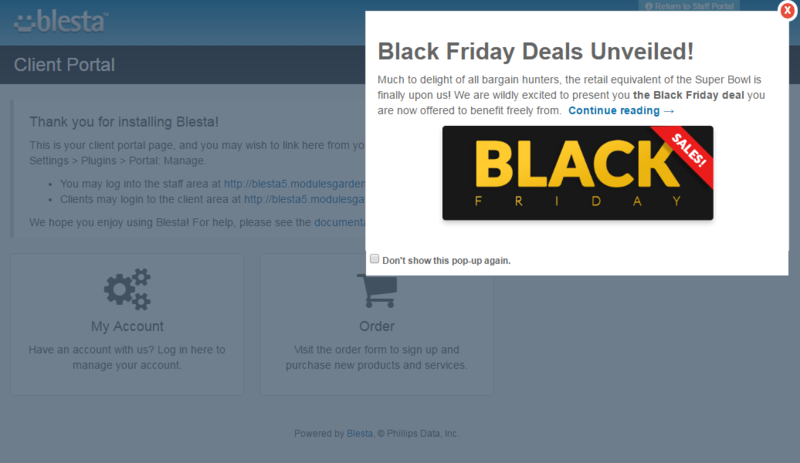 Preview the pop-up - a sample page with a visible pop-up will appear. This is the final look a client will receive. 2. Edit the pop-up - change the restrictions, timing or style. 3. Move the pop-up to archive, you will be able to restore it at any time in the future. 4. Delete the entry. You must be completely sure, you will not be able to have it back in any way. Inactive pop-ups are those for which the end date has been crossed and they are no longer displayed to clients. Just like in case of active pop-ups all actions are available. You may edit it to change the end date and at the same time activate it again. Pop-ups in archive are moved there manually, these can be the previously active or inactive pop-ups (use action button to move entry to 'Archive'). You may restore archived pop-ups any time and, depending on the end date of the resorted pop-up, it will be moved either to 'Active' or 'Inactive' group. 'Styles' section contains a list of all predefined styles, that position your pop-ups. There are 14 types of different styles, that vary from one another with up or down position, right/left/center, overlay option etc. If non of the predefined styles perfectly matches your needs, you may edit the styles. Press the icon as marked on the screen. 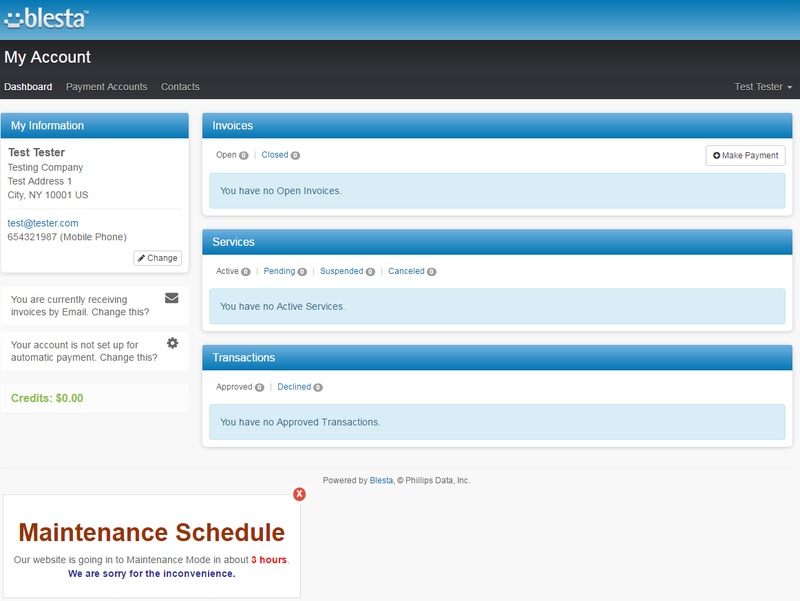 You are moved to the style edition page with CSS and HTML details. You may edit them as you need to adjust the style to your preferences. In case the predefined styles are not sufficient and you do not want to lose any by editing its content, you may always add a new style. Press the button as on the screen to do so. Provide your customized content or copy and modify a predefined style content. Save the changes in the end. The last position in your navigation menu, when clicked, redirects to the article you are currently reading. 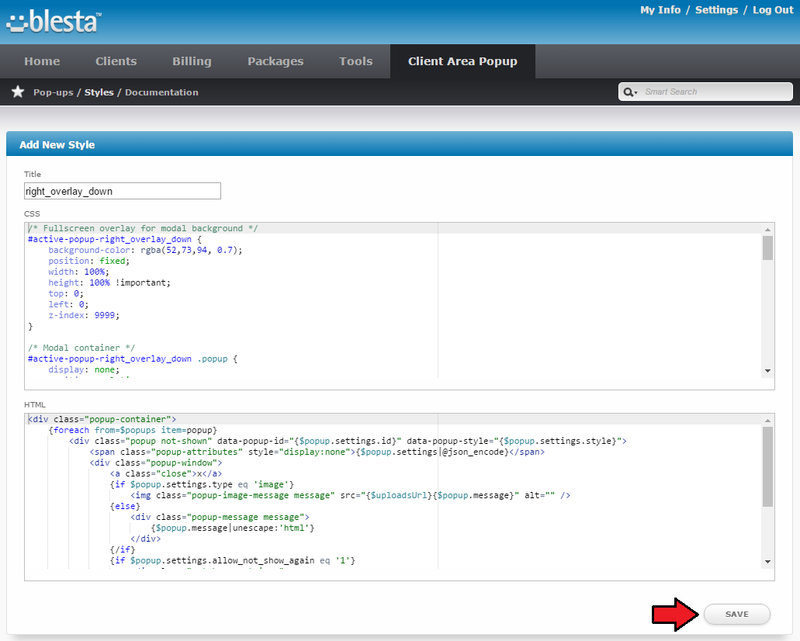 Now, let's take a look at what Client Area Popup For Blesta may give you in practice. Below, you will find several examples of pup-ups, each in a different style and of a different type. 'Overlay' means there is a gray background behind the pop-up text or image. 2. The module is ad blocker resistant unless in the tool your clients block the popup class deliberately. This page was last modified on 14 March 2019, at 14:49.